Aircraft maintenance is important to anyone who has ever ridden in an aircraft. It’s what keeps them safe at takeoff, while they are in the air and on touch down. This kind of maintenance often requires removal of an aircraft from a hangar just to allow a crane to pick off parts for repair or to get access to parts that need repair. EZ Rig Crane helps with that. Just as important is that the EZ Rig Crane has a very small footprint when collapsed for storage. Our South Korean client, Sharp Technologies, saw that as a very important feature. Storage room is at a premium at an airport. Regional and Local Airports find the EZ Rig Crane more than able to tackle the smaller rigging tasks that would otherwise call for a much more expensive crane to get the job done. It’s either that or take a greater risk with workers and equipment to get the job done. No one likes greater risk. Many clients take advantage of the portability of the EZ Rig Crane. Weighing in at 700 pounds, it is easy to transport by pick up truck. It comes apart in minutes and can be reassembled anywhere in less than an hour. It will fit though a regular 3’-0’ x 7’-0” standard door and you don’t even have to remove the door. Flagler County Fire Fighting Group uses the EZ Rig Crane to pick parts off their helicopter. 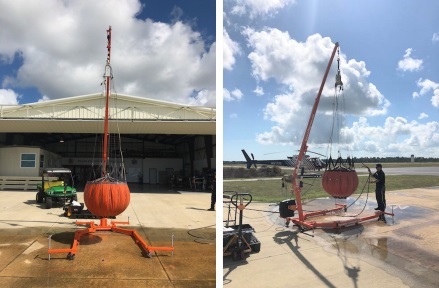 “I’m not going to use just any piece of equipment to lift parts off of a $3-million-dollar helicopter.” Says Todd Whaley, Chief Pilot and Mechanic. Well, he is using the EZ Rig Crane to do just that. Thanks, Todd. Lot’s of aviation professionals saw the EZ Rig Crane at the Ground Services Equipment Expo in Las Vegas in early October 2018. It was well received and got spotlighted in the product profile section of the event’s newsletter. Pretty impressive. If you need some help to determine if the EZ Rig Crane is the right tool for you, give us a call and we can walk through the many applications for this uniquely powerful mini crane. Have the EZ Rig Crane help your company, airline, military, or municipality, in maintaining your aircraft fleets. To see how we can help your MRO.